UPDATE: As of mid 2012, Schwinn ceased production of the Jenny. As of mid 2017 the Schwinn Traveler Womens is closest equivalent. Don't be fooled by the rocks that she's got, this Jenny is a solid and reliable entry level bicycle wrapped up in a pleasingly understated package. Amongst 'real' cyclists, Schwinns lost all of their cachet once they ceased production in the U.S. but from the moment I pressed down on her pedals after an almost 15 year absence from the bicycling world, I was won over by the Jenny's modest, mass market charms. Schwinn 'Jenny' 7 Speed - Retails between AU$400-$600. As photographed in the exotic locale of the Fat-Bottom Household Lounge Room. I'm not really risk-averse but I'm no bungee candidate either so I was slightly nervous when first I test-rode the Jenny. Firstly, it had been over a decade and it wasn't my bicycle so I feared a 'you break it, you bought it' situation. Secondly, the saddle had been properly adjusted to my leg length and it was a higher position than my memory of bicycle seat heights, probably at the direction of my parents either out of ignorance or safety concerns. I fully expected disaster on the hot gravel of Canning Bridge Cycles rear car park, particularly as there was a gym next door and it appeared to be 'Gymnasium Hour'. Everywhere I looked there were monster 4WDs birthing tank-topped, micro fibre towel toting gym bunnies. There was also an abrupt descent at one end of the car park which ended in something semi-industrial involving metal detritus. I needn't have worried. The Jenny was comfortable and stable to me from the first push to the final, exuberant stop thanks to her sturdy steel frame, instantly responsive front and rear caliper brakes and broad, soft saddle more like you'd expect on a beach cruiser. (It's actually the Schwinn 'Downtown' model.) The upright position gave me a wide view of the cars trying to kill me and made a significant psychological difference to the amount of control I felt I had over the bicycle. 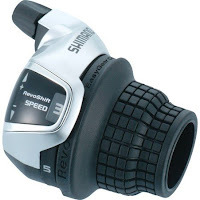 Not that it was all in my head: The 7 speed Shimano gears are operated by the novice friendly 'revo shifter', something I hadn't even heard of at that point let alone personally encountered. The last time I'd seen gears they'd been thumb shifters on late 20th century bicycles so the smooth rotating action of the revo shifter seemed miraculous. Once I had established which number gear I had set off in, I didn't have to look at the shifter to turn it or keep track and a reassuring 'click' told me I was on target. Shimano 'Megarange' 7 speed, 'Super-low' 14-34. The numbers mean the smallest cog has 14 teeth, the largest 34. The larger the cog, the easier the gear. It sits in a seamless fashion above the handle bar grip and shifts by a rotating action using the rubber section. Your hand barely moves from the normal riding position so it's a great system for less confident riders. Surprisingly, there's not really a wasted gear on the Jenny when it comes to traversing the somewhat erratic topography of suburban Perth. Bike paths are as smooth as it's possible to make them but even they cannot escape passing through suburbs with the prefix 'Mount'. As it was built over everything from sand dunes to swamps, Perth can be delightfully flat and then suddenly slap you with a hefty slope, requiring a very speedy transition from seventh gear down to first. The no-brainer revo shifter excels under these conditions where other types of more 'mindful' shifting might find you reaching the base of the same hill still in third if you've had to stop for traffic as well. At times like that, I rather wish both my bicycles had revo shifters. I probably spend the least amount of time in 6th gear but there's no single setting I shun, they all have a job to do. Your money goes on smooth shifting rather than metal head-badges. The Jenny is relatively light for a steel bicycle with such a 'big' feeling frame, I have no problems lifting it up my front steps even after a particularly tiring ride. At 175cm (5ft 9"), I am at the taller end of the average height for an Australian woman (Most women I know are over 5ft 6", under 5ft 10".) yet my Schwinn Jenny is a size 'S' frame. The 700c wheels add to the 'large' feeling but if not for a later discarded sticker indicating the frame was for up to and including 175cm I wouldn't have believed I'd get away with a small. Schwinns are obviously sized large. extra decoration went entirely unnoticed by me until I took this photo. The other features of the Jenny that attracted me were the chain guard and pannier rack. Other than the generous gears and the very plush saddle (Even a fat bottom needs some cushioning) these are the two 'at market' features which really made this bicycle an excellent re/introduction for me to transportation cycling for the price. When researching I found many entry level steel frame bicycles that offered either a chain guard or an appropriate number of gears. Not many included a back rack though a lot had cute but flimsy front baskets which were clearly meant to appeal to a certain demographic. (Hipsterettes. The demographic is Hipsterettes.) Unfortunately the 'vintage look' market also means vintage amounts of gears (3 or 1 speed), manufacturers counting on the fact that most of these bicycles will be used for very short journeys made purely to impress other Hipsters at inner-suburban pubs or 'pine crates for chairs' cafés. I admit: I'm partial to a wicker basket but I also wanted to carry things weighing more than two baguettes or a litre of that Hilo slop which dares to masquerade as milk. I wanted to go further than my local deli and I wanted to do it dressed as myself. The rack was a must. The Jenny's back rack has a fiercely sprung trap with a good range of motion. So far I have used the rack alone to relocate a boxed cheesecake (That time I used a belt as well because it was my first time trusting the rack), a biscuit tin full of my own dinner and an esky full of dinner for five. I purchased the front basket from the bicycle shop, it's only rated to hold 5kg so it's strictly for my handbag and any layers of clothing I might jettison during a ride. The chain guard means I can travel without getting grease on my leg and it offers a reasonable level of protection against the chain chewing on my pants. (It's probably still advisable to secure any 'Vintage Clothing Market' flares with a hair elastic.) The Schwinn Jenny also comes with a basic hammer strike style bell, a tiny gong to announce your presence as you circumnavigate your fellow man and any excitable dogs your fellow man may not wish to be interacting with your spokes. I eventually purchased three Knog lights (Two front and one rear) to complete the Jenny, happy to support an Australian design even though the people behind it are Category 5 Hipsters (Their ad campaign features a woman about to engage in sexual congress with the 'Boomer' front light). a red rear light and a front light. I can kind of see why she does. Not only do Knog lights look nicer than the thrusting, metallic POWER BEAMS!!! aimed at the Roadie commuter market, they come in a range of nice colours and feature a rubbery and clever quick-release attachment system which solved my personal problem of Basket Vs Headlight positioning by allowing me to attach them to the fork without using any tools. It also allows me to swiftly remove them to my handbag in the event of Shifty Hipster sightings in those more 'troubled' areas. You know, the ones with Porsches. Post lights and basket, I think the Schwinn Jenny 7 Speed has reached her full potential as a fair weather transport bike/leisure ride and has provided the perfect level of coddling to regain my confidence as a cyclist. She's dependable, practical and fun. For an entry level upright bicycle, I wouldn't ask for more. I've since retired the wicker front basket and fitted the Jenny with Basil Memories Bottle baskets, my review and photos here. Very interesting article and sounds like the bike to go. Would you be able to tell me where a `Jenny` is been sold and how much (exactly) in Perth? I live in Perth and thinking of getting one of this kind for my female friend, who is wanting to start cycling. Greatly appreciated for your help!! Sorry for the late reply! If you look on bikeexchange.com.au and search by brand you should find Schwinn Jennys, although I bought mine from Canning Bridge cycles and they were perfectly pleasant in terms of customer service. P.S. I'm not worried about Chinese manufacturing with regards the Schwinn because it's made of steel rather than aluminium, Schwinn still have a fairly decent reputation (unless you ask somebody who owns a really old, tank-proof Schwinn from when they were American made) and it seems acceptably sturdy. It's true that a Chinese made aluminium cruiser from Big W would not hold up but when you realise that 99% of bicycles available in Australia come from China, well - there are many factories and many standards of workmanship. It really comes down to deciding which brands to trust. I purchased the "eggplant" colour, and it's beautiful. Everyone adores and compliments the colour, even the hardened roadies. In fact, I use the alternative name for that colour - "aubergine"... it sounds as nice as the actual colour. There's a solid 1970s aesthetic to the 2012 colour scheme where as my monochromatic 2011 feels more 1960s to me. The 2010 Jenny was a delightful, sunny yellow with a white chain guard and white detailing. It had a 1950s vibe. Let's hope they don't do a 1980s one for 2013!